Sound enhancers are nothing new. Windows Media Player has SRS TruBass and WOW, which enhance bass and expand the sound field, built right in. iTunes and many MP3 players (with the noticeable exception of the iPod series) also have enhancers. 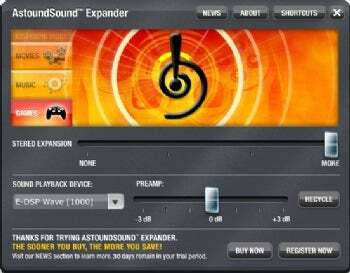 However, AstoundSound Expander ($40, 30-day free trial) is rather unique in the consumer field in its ability to create a 3D sound field with virtually no fuss. AstoundSound Expander's interface is simplicity itself and may be controlled when minimized to the system tray by keyboard shortcuts.